Welcome to my birthday week giveaway. For the last 20 years my creative life has revolved around designing projects for national magazines and my own books. It has been a wonderful fulfilling career that allowed me to work from home, experiment with different media and share my designs with 'makers' around the globe. I also had a perpetual excuse to get out of cleaning the house! Over the last couple of years I've refocused my energy in developing my own product lines. My kit business was founded on the success of Stitched Whimsy, Fairytale Sewing and the work I contributed to Stitch magazine. Our kits make small sewing projects even more accessible by including all the materials with the instructions, allowing you to sit back, relax and create. 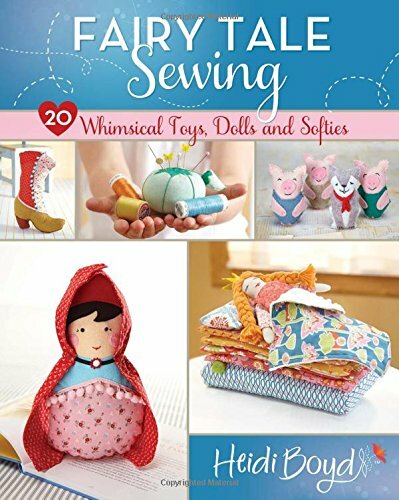 If you're already the proud owner of a fabric stash, and sewing machine, these books are filled to the brim with cute quick projects. The reversible play totes are one of my favorite projects from Fairytale Sewing, the instructions also include patterns to make Goldilocks and The Three Bears dolls. These three Fairytale Sewing hoops are very similar to my applique Hoop kits, I love how quickly the felt stitches in place to make a charming scene. Ideal for decorating a nursery or playroom. I was a mum to two boys first so projects for boys will always be near and dear to my heart. This fold up castle from Fairytale Sewing would have been a hit with my two sons, they were always ready for a knight and dragon battle. It cleverly pulls apart to travel flat, then quickly reassembles with the help of Velcro tabs. I love making toys for children, I'm still a kid at heart, albeit it a 50 year old kid on the 12th. I have no intention of growing up, I will always make cute things simply because they make me happy. You'll find my newest designs in PDF Instant download format. Please take a moment to enter my giveaway, it's open to US Residents only due to shipping costs.